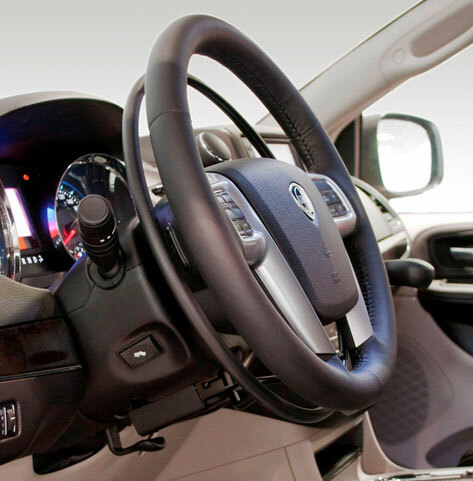 K5: The beginning of a new age, where, with just hand controls, you can choose to drive in 5 different ways….. The K5 can be used in cars with an automatic transmission or automatic clutch by drivers with lack of mobility to the lower limbs. It transfers the accelerator control from the pedal to the steering wheel, allowing you to accelerate with one or both hands. This product is developed and projected specifically for the car model in that It will be installed. In this way it fully respects the original car design, keeps the good looking of the passenger compartment and it is very comfortable to be used. The accelerator ring is placed under the steering wheel. For that reason it does not interfere with the eventual airbag coming out or with the working of the horn, it allows the steering wheel to keep all its adjustments and it does not obstruct the view on the dashboard.